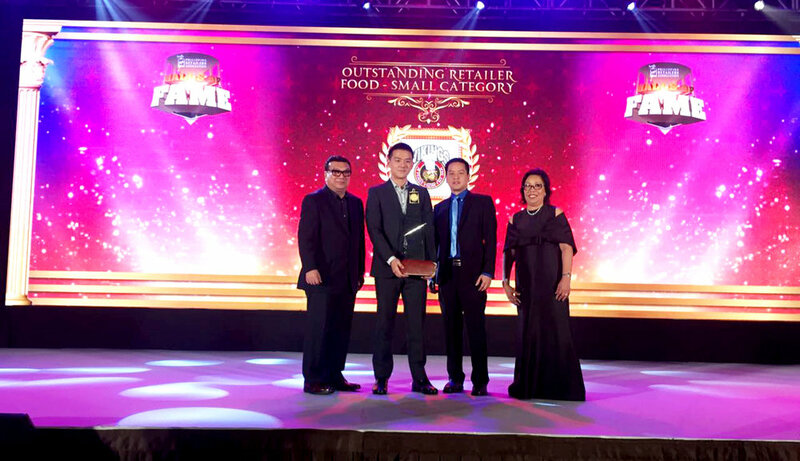 Vikings Luxury Buffet has been awarded for the third time with a prestigious Outstanding Food Retailer 2016 Small Category, thus earning its right to become a Hall of Fame Awardee. Held at Solaire Resort and Casino in Pasay City last July 27, 2017. The award was presented by the Philippine Retailers Association, the pulse and voice of the retail industry of the country. In its quest to inspire Filipino home-grown retailers to be globally competitive the PRA in partnership with the Department of Trade and Industry (DTI), yearly recognizes outstanding Filipino retailers who are a model of success in its growth and ethical practices through the Outstanding Filipino Retailers and Shopping Centers of the Year Awards, also dubbed as the ‘Oscars of the Philippine Retail Industry’. From having a single branch in Mall of Asia back in 2011, Vikings Luxury Buffet has now grown to ten branches giving Filipinos across the country an opportunity to experience a value for money quality feast that only Vikings can give. With its rapid growth and its number of accolades, both local and abroad, the Vikings Group has further expanded its service to the Filipinos by establishing a variety of concept stores namely the Niu by Vikings, Four Seasons Buffet and Hotpot, Nords Bread Hub, and Tongyang Plus which is set to open soon this 2017. Each brand keeps up with the legacy of Vikings Luxury Buffet, and are making a mark in the industry by its own, just as how Niu by Vikings was recognized as a finalist for the Most Promising Retailer Food Category on the same awards night. True enough, the Vikings Group has never stopped on its pursuit of excellence making its mark in the Filipino retail industry and in the heart of its beloved Filipino patrons. The people have chosen! 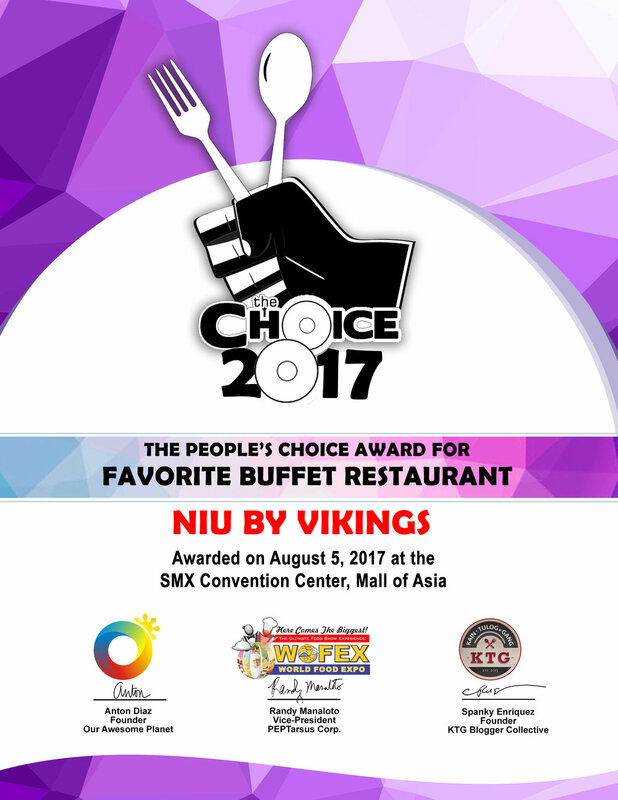 Niu by Vikings was hailed as the people’s choice for Favorite Buffet Restaurant at The Choice 2017, held at the SMX Convention Center last August 5, 2017. The Choice Awards acknowledges crowd favourites in the food industry determined by an online voting system. The people behind The Choice 2017 are the Philippines’ number one food and travel blog, Our Awesome Planet, and the KTG (Kain, Tulog Gang) a collective of online influencers behind some of the country’s most influential blog sites. Niu by Vikings the upscale version of Vikings Luxury Buffet, opening its doors daily to serve its guest with a grand selection of exquisite dishes masterfully made from quality ingredients. Being hailed as the people’s favourite buffet restaurant for two consecutive years, Niu by Vikings remains at awe by the warm recognition from its valued guests. Our Vikings chefs have fought hard and have once again proven mastery over their craft at the Philippine Culinary Cup 2017! Vikings Luxury Buffet Corporate Chef, Anton Abad and Sous Chef, Pax Ignacio won in the PAL In-Flight Category last August 4, 2017 at the SMX Convention. Battling it out with 15 other competitors from recognized culinary institutions, our chefs rose up to the challenge and brought home gold through their Economy Class Menu: Sarsiparilla Adobo Sauce and Malagos Duo of Chocolate. With this win, you can look forward to try out their winning dishes as these will be included in the Philippine Airlines’ Economy Class menu. This achievement stands as testament to the passion and artistry our chefs pour out in every dish they serve. How do you like your Avocado? Sweet and light for dessert? Rich and buttery for your Guac? Or cooked to perfection blended into your favourite dish? Either way, Avocado never disappoints with its unrivalled perfection. The Philippines largest luxury buffet is bringing to life all your Avocado Dreams! For the whole month of June, we are serving you with a dreamy Avocado Menu fit for a King. Now read on as we give you a glimpse of the majestic feast that awaits when you visit! Let us start with this stunner, slices of our Avocado loaf will leave you in awe. Freshly baked soft bread with buttery chunks of Avocado oozing from the inside. A fitting start to your Avocado escapade. Who wouldn’t dream of binging on pizza the healthy way? Well, our Gamberetto Avocado Pizza is definitely a gift from above. Sprinkled with pieces of shrimp, avocado, greens, and cheese baked to perfection, this dreamy dish will sail you off to pure bliss. The contradicting texture of its crisp exterior, and creamy avocado inside will leave a lasting impression on your tongue. So if you’re up for a real treat, this Karokke should be top on your list! The Mediterranean flavor of this seafood dish delightfully complimented by the light soothing taste of Avocado is something that’ll put you on a daze. Catch the impeccable combination at our Bacolod branch. The roll of your dreams has come to the metro. Creamy Guacamole rolled over chicken, and bacon with a refreshing chili twist. This hot dish is the best treat for every foodie looking for something good. A sumptuous feast on its own, this honey glazed turkey will heat up your taste buds with the delicate flavors of turkey spiced up in all the right ways. Yes, here at Vikings you can indulge all you want in the goodness of our addictive Beef Enchilada Rice. Oozing with rich Latin American flavors, this extravagant dish will take your avocado dreams to new heights! Fun and colourful to the eyes, yet simple and light to the taste! This avocado dessert easily becomes a crowd pleaser. Yes, we’ll keep it simple; this dreamy confection is definitely a must-try. A beauty to behold, this heavenly dessert is the healthy treat for your sweet tooth. Perfectly moist and luscious brownies topped with a delicately sweet guacamole mousse that’ll gently sweep you away with every bite. This creamy creation ain’t our featured photo for no reason. Its stunning beauty and exquisite taste embodies a perfectly sweet dream come to life. You know, dreams simply can’t be put into words, its beauty is experienced and felt, and like all dreams, this marvellous menu won’t be here for long. So hurry, book a reservation at your favourite Vikings Luxury Buffet branch and experience for yourself the wonder that looms through Vikings for the month of June. Need more convincing? Watch our dreamy avocado video for a delight to your eyes and a tease to your appetite. Mother’s Day is nearing and we know how planning the perfect day could be overwhelming. However, we at Vikings have come up with a short article which we’re sure your moms will relate to! When you expect to be eating out with the family on a special occasion. When you find out you’re wrong in an argument, so you become emotional and sort of “win”. You always make sure the family doesn’t starve! You become easily irritated because you’re too tired from doing all the chores! Whatever you do, we still love you! Relate?? Let this reach your mom in a touching way! Like, share and tag! Not often will you be given the chance to serve world’s best chefs, Vikings Luxury Buffet has been given the honor of doing so for three consecutive years. The Madrid Fusion Manila is a premier event for the country’s food community. Chefs behind Michelin star and World’s 50 best restaurants visit Manila for a three day conference and trade expo. From its first run back in 2015, Vikings Luxury Buffet has been a significant part of this grand culinary event. The three-day gastronomic event kicked off with a Welcome Night at SM Mall of Asia by the Bay last April 6, 2017. The night was graced by the culinary delegates including Gert de Mangeleer (Hertog Jan), Pedro Subijana (Akelare), Rodrigo de la Calle (El Invernadero), and Paco Perez (Miramar). Vikings Luxury Buffet was one of the chosen few restaurants from the country to serve their very own fusion dishes from traditional Filipino delicacies. The modern twist on this beloved Vigan classic is a dish that is hard to miss, with the medley of greens, quail egg, and our very own special sausage packed into one hearty meal. An array of Filipino dessert favourites whipped up into one enchanting dish, Vikings’ Tres Marias Butchi. Butchi coated with Almonds, stuffed with Guimaras Mango, Suman Pinipig and Ube Halaya served with Macapuno Ice Cream and dusted with Salted Egg, with this dish, you certainly can have it all. Indeed, in serving the best, Vikings Luxury Buffet has not held back in giving their best, nothing less from the country’s largest buffet restaurant. As Vikings Luxury Buffet celebrates its sixth year in service, they reaffirm their pivotal role in Filipino lives. Starting from a single branch in SM Mall of Asia back in 2011, Vikings has made its mark as the countries’ largest buffet restaurant. With that much influence, and reach, Filipinos have embraced Vikings and have spent countless momentous occasions on the beloved establishment, from baptisms, weddings, graduations, and birthdays, to job promotions, reunions and even marriage proposals. To celebrate the true beauty of Filipino lives, birthday celebrants at Vikings are given complimentary cakes, and for over six years, and nine more branches later, Vikings Luxury Buffet has served over two million birthday cakes to date. These numbers not only reflect the growth of Vikings over the years, but also show that those 2 million people, and countless others are the ones who have helped bring Vikings to where it is today. When the sizzling sun is gleaming at you all day, you know what season it is. Summer has arrived! Vikings Luxury Buffet gives you a whole lot of new culinary gems to discover this summer, as they launch their International Summer Food series. From March 15 - April 14, get to experience how summer tastes like all around the world as you visit any Vikings branch nationwide. We’ve listed down a few notable dishes from each branch for you to try out. As visually stunning as it is, this Eastern European treat is guaranteed to lift your spirits to a summery bliss. Every doughy twist bursting with luscious chocolate, you’ll have a hard time controlling yourself for another bite. This is a refreshing take on the popular Greek food. With the Cucumber Rita coolly balancing out the surge of flavors from the Beef Gyro, everything goes well to make one perfect dish. Sushi donuts aren’t only as appetizing as it looks. This tempting Japanese food craze will leave a lasting impression on you, with every bite overflowing with delicate flavors of the sea. Cool off with this refreshing salad with a hearty serving of prosciutto, and a healthy blend of fresh vegetables, and minted melon. If you want things spiced up, you’ll definitely love this pizza. With a generous dash of Mexican spices savory meat, red beans, and a drizzle of aioli, this dish will surely add more sizzle to your summer. This delightful treat of the sea served with a complimenting tropical salsa, will surely give you the summery beach taste you’ll adore. A popular summer American dish, the Beer Can Chicken is perfect for casual hearty gatherings. Immaculately succulent meat that satiates your taste buds, this oven roasted poultry dish is definitely a feast on its own. Feast like a king, with the ideal meat to binge on this summer. Lamb shanks with simple, yet rich flavors, tenderly cooked to perfection. Cleanse your taste palate with this tropical take on the classic Italian dessert. The soft texture of the pudding goes exquisitely well with the summery selection of fruits. Now, this modern execution of the timeless New Zealand delicacy is a masterpiece to behold. Heavenly meringue mounted on a moist chocolate base, topped off with an assortment of fresh fruits. Have a taste of this treat, and experience a wild summer party raving inside your mouth. These divine summer dishes are just a glimpse of what’s truly awaiting you at each Vikings Luxury Buffet branch. Now, plan out your summer food escapade with your food buddies, and together explore these international culinary masterpieces. The country’s largest buffet restaurant has earned yet another accolade to add to their stack of achievements, as Vikings SM City Cebu was recognized as Sun Star Best of Cebu 2016 Best New Restaurant Buffet. The Sun Star is a newspaper based in Cebu since 1982, the only major national paper that is not based in Metro Manila. Through its magazine, the Sun Star Weekend, Sun Star annually acknowledges products, services, public places, and establishments that embody the best that Cebu has to offer. The Cebu branch opened its doors last year, May 10, 2016, with its lavishly designed pop inspired interior. Vikings Cebu brings a distinct buffet dining experience to the Cebuanos, serving unlimited quality dishes from all over the globe, diners get to be a Viking for a day by conquering the diverse food stations, and experience an adventurous fusion of flavours. Receiving recognition on its first year of service stands as testament to the unwavering pursuit of excellence of Vikings Luxury Buffet, and their established rapport with the Cebuanos. It’s 2017. A time when creativity and self-expression takes center stage. With the emergence of art fairs, and art workshops around the metro, and the abundance of Do-it-Yourself viral videos circulating around social media, everybody is itching to create. Four Seasons Hotpot and Buffet provides an avenue for creativity with its hotpot buffet concept where you can personalize your own hotpot according to your own preference. Four Seasons Buffet & Hotpot has opened its third branch in SM Southmall last January, 2017. South peeps can not only enjoy the perks of having to customize their own plate with a wide array of culinary masterpieces, at Four Seasons, diners can experience the pleasure of customizing their own hotpot. Whether you’re feeling wild and you want to go for that fiery hotpot with exotic ingredients, you’re feeling laid back and you think the traditional hotpot is the best for you, or you want to tap the carnivore inside and go all meat, it’s all up to what your taste buds crave for. You get to play chef for a while and pick out from a vast assortment of the finest and freshest ingredients, carefully picked out by Four Seasons to give you the best hotpot experience. There are endless outlets for creativity and self-expression and Four Seasons Buffet & Hotpot wants you to enjoy the best, while giving you the freedom to add your own touch to it. METRO MANILA, PHILIPPINES – 28th, June, 2016 – Vikings Luxury Luxury Buffet, the Philippines Largest Buffet Restaurant, today announced that it has received a TripAdvisor® Certificate of Excellence. Now in its sixth year, the achievement celebrates hospitality businesses that have earned great traveler reviews on TripAdvisor over the past year. Certificate of Excellence recipients include accommodations, eateries and attractions located all over the world that have continually delivered a quality customer experience. The award is presented to the corporate business world by the Department of Trade and Industry (DTI) and the PRA for establishments that have reached a certain standard of qualifications of service and quality to the community. The recent award was presented to VIKING LUXURY BUFFET during the awards night held at the Marriott Grand Ballroom at Newport City Complex in Pasay City. The award was received by the restaurant’s Operations Managers Divine Villanueva and Hazel Rodriguez supported by some company officials during the ceremonies. The largest buffet restaurant in the country is on its fifth year of its quest for excellence in providing quality food and service to its guests. It operates eight restaurants in Metro Manila, and one each in Davao City, Bacolod City and Cebu City. Proven by its various national and international awards, the Vikings group of restaurants has proven its marketing directions through its promotional efforts provided to its patrons the whole year round. Among them are the free birthday treats, the wedding anniversary discount, OFW free dining, month-long birthday celebrant free birthday blow-out coupled with its creatively-promoted food offers during special holidays. The awards received by the company are a true manifestation of its desire to continually provide its patrons the highest standards in the food industry. The table reservation system it adapts is an innovative process of providing easy access by its enthusiastic diners who come in groups to enjoy truly what good food is all about. Vikings Cebu Opens May 10, 2016! It’s another style of enjoying great food coming from more than 9 nations and cultures from around the world as Cebu City welcomes that moment of great dining experience that Cebuanos and their visitors would love to be happy with. VIKINGS LUXURY BUFFET, the largest buffet restaurant in the Philippines and an international award-winning food chain in the country is set to open soon in SM City Cebu to provide Cebuanos and Cebu residents and tourists the best there is in the eat-all- you-can dining style. How can you say no to a long line of mouth-watering cuisine that will flare your heart’s desire for the biggest treat that Vikings Cebu boasts of offering you with a variety of food that the restaurant’s chefs have on the line for you and your family and friends? Your heart beats to the excitement as you start looking at the American treat of roast turkey, chateaubriand steak, flat iron steak, rib of lamb for the meat lovers. Next on the line you can pick up those pizza and pasta with those Italian flavors the way you want them to be. Asian flavors specials from Singapore, Thailand, Malaysia, Indonesia come in daily in different recipes that you must not miss to take a bite or two. Filipino grilling comes next as you ask the chef to grill those squid heads, salmon ribs and head, fish belly, pork cuts, barbeque styles, and more. Chinese cuisine lovers beat up their excitement as different recipes of the famous siomai, machang, cantons, shabu-shabu, siopao, noodle mixes and roast duck are just on hand waiting for the guests. Japanese concoctions of various makis fill up your plates and another platter on the hand can be ready for the famous sashimi cuts of tuna and salmon being the daily favorites along with shrimp and veggie tempura, and other recipes. Another delight surprise is the unlimited beer day and night, unlimited beverages including tea and coffee. Sweet lover would line up for the unlimited fruit slices, crepes, soft drinks and unlimited juice flavors of the day. Do not take for granted the kids as a long line of unlimited ice-cream offers await them plus all th gummy bear they can grab along with that chilly yoghurt, leche flan, and so many desserts that you will just love to be into your tummy’s satisfaction. Surprisingly, your dining experience will just make you discover that it is truly a value-for- money as Weekday Lunch is only at P688. Weekday Dinner and Weekend and Holidays Lunch and Dinner are tagged at P888 only. That’s a great affordable treat from Vikings Cebu located at the North wing of SM City Cebu. The continued efforts of the ground verification team in the Mt. Apo incident has seen the fire control at 99% safe level although there is still a lot of work to be done from assessment to fire line maintenance to rehabilitation. Along the government efforts on this incident, DENR-PENRO Davao del Sur, meanwhile, expressed its deep appreciation to Vikings Luxury Buffet Davao for undertaking the company’s Corporate Social Responsibility (CSR) mission in donating relief goods and other commodities to the ongoing rehabilitation activities of the government. The country’s natural attraction, Mt. Apo, experienced massive forest fire during the Holy Week this year and thousands of volunteers and government workers were deployed to the area to protect the forest. The Vikings Lanang Davao CSR Team, together with DENR Davao, visited the DENR office in Digos, Davao del Sur where the Vikings Team handed over the joint contribution of the company and its employees to the DENR officials and Communications Officer as the company share of support to the workers who have sacrificed to join the forest fire operations. Vikings commits to extend its helping hand through all its stores as it shares to the communities its corporate social responsibility muscles in providing what it sees best. Four Seasons Buffet & Hotpot. The HOTTEST Buffet in the Metro! From the group that brought you Vikings Luxury Buffet and NIU by Vikings comes a new hotpot buffet concept: Four Seasons Buffet & Hotpot! This new brand opens its first pioneering branch along the Mall of Asia bay area, overlooking the majestic Manila Bay; and its second branch in Araneta Center - Manhattan Parkview. Designed with a lavish and modern market interior, Four Seasons Buffet & Hotpot serves a wide assortment of fresh and healthy ingredients that are carefully handpicked by the chefs every day, allowing hotpot enthusiasts to freely customize their own dishes. From Philippine Tatler: "Four Seasons Hotpot City is a buffet restaurant concept that marries farm-to-table offerings with hot pot cooking." Check out what they have to say about Four Seasons Buffet & Hotpot: Mall of Asia! Click here. From When In Manila: "Four Seasons Hotpot City located right behind Mall of Asia, could just be your next eat-all-you-can stop, on a healthier level. And you know its going to be good food because it comes from the Viking group (the ones who brought you Vikings Luxury Buffet and NIU by Vikings)." Check out When In Manila's experience by clicking here. Want to know what are the Top 10 Dishes at Four Seasons Buffet & Hotpot: Cubao? Check out some of the recommendations made by When In Manila, click here. Since Vikings Luxury-Buffet Restaurant opened at the Seaside Boulevard at the Mall of Asia complex, it has become one of the top-of-mind contenders in the buffet chain arena. It’s no easy feat serving 200 international dishes daily and providing good service, but after launching several branches in many parts of the metro, not to mention Vikings Niu and Four Seasons Hotpot City, the buffet chain has proven they’re top-of-mind for good reason. Vikings Luxury Buffet, the Largest Buffet Restaurant in the Philippines recently won its first international award presented this December at the Grand Harbor Hotel in North Point, Hong Kong. The prestigious award to Vikings bested other companies from Hongkong, China, Singapore and other Southeast Asian countries. The Yazhou Zhoukan Asia Excellence Brand Award 2015 was proudly received by Vikings Managing Director Jackson Go and Vikings Marketing Director Charles Stewart Lee in a grand awards night in Hongkong. In receiving the award, Vikings’ Charles Stewart Lee expressed the honor with pride receiving the award for the Philippines Largest Buffet Restaurant. We did not expect to be here since we only started in April 2011 and it is extremely heart-warming to see what the company has achieved through the years, Lee said. He mentioned his deep appreciation to the loyal customers and suppliers for constantly supporting the company’s venture and expansions and the constant feedbacks from its customers on how to improve further the service. In an ambush interview in Hongkong, Lee again stated his company’s surprise of winning the award as Vikings was up against larger companies from the different regions of the world. Asked on the brand strategy of the company, Lee mentions of the company’s offering high quality food and service within a hotel ambience at a competitive rate. Throughout the years the company constantly listens to what the customers want it to improve on. The company sees to it that the customers are given a new taste of the brand by offering different interiors and different menu per branch so that they have a reason to visit all of our stores and it has given the brand a personality that no other buffet restaurants in the country has done which is to give it an image of “feast”, Lee emphasized.